A broad view of SQA. 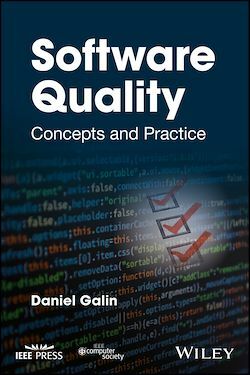 The book delves into SQA issues, going beyond the classic boundaries of custom-made software development to also cover in-house software development, subcontractors, and readymade software. An up-to-date wide-range coverage of SQA and SQA related topics. Providing comprehensive coverage on multifarious SQA subjects, including topics, hardly explored till in SQA texts. A systematic presentation of the SQA function and its tasks: establishing the SQA processes, planning, coordinating, follow-up, review and evaluation of SQA processes. Focus on SQA implementation issues. Specialized chapter sections, examples, implementation tips, and topics for discussion. Pedagogical support: Each chapter includes a real-life mini case study, examples, a summary, selected bibliography, review questions and topics for discussion. The book is also supported by an Instructor’s Guide.